WASHINGTON, D.C. – California politicians are considering a measure today that cuts off crucial state aid for low-income minority students, this time by discriminatorily cutting it for students who choose to attend private religious colleges. 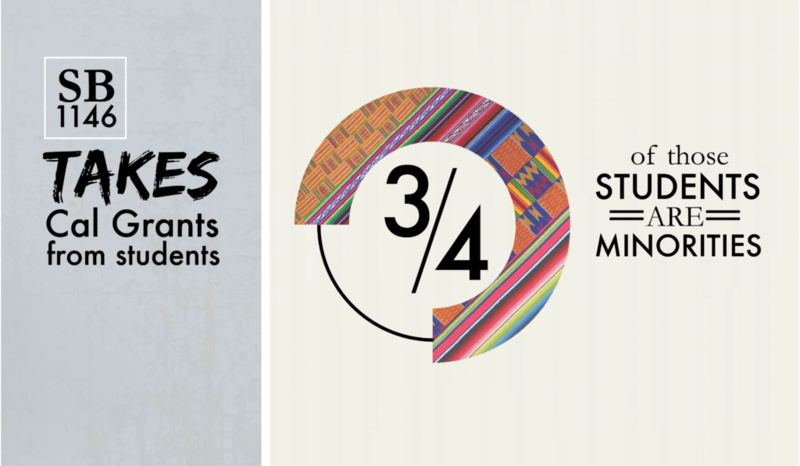 A new website explains how SB 1146 victimizes poor minority students, many of whom are the first in their families to attend college and would either have to drop out of college or be pushed into failing state schools with dismal graduation rates for minorities. California’s legislature has recently repeatedly proposed cuts to the long-standing Cal Grant program. Cal Grants provide funding for low-income students, three out of four whom are minorities. After failing in a bid to cut Cal Grants for all private colleges last year, the legislature is now considering a move to cut aid for students attending certain private religious colleges. But religious schools have high 4-year graduation rates, roughly double the rate of state schools. And because state schools come with high state subsidies, taxpayers could end up footing hundreds of millions of dollars more in costs if students get forced out of the private religious schools of their choice and into state schools. SB 1146 will most severely harm California’s African-American and Latino students. Such students disproportionately come from communities that are both deeply religious and financially disadvantaged. They enjoy very high rates of success at religious colleges like Fresno Pacific University, which graduates 60 percent of African-Americans and 70 percent of Latinos within 4 years. But by comparison, the California State University system—where most poor minorities would be funneled if SB 1146 passes—manages to graduate only about 9 percent of African Americans and Latinos in 4 years. SB 1146 is scheduled to be heard by a legislative committee today at 9 a.m. PST, to receive a vote in committee by Aug. 12, and could end up before the legislature for a vote by Aug. 19. If it passed, the governor would then have until the end of September to decide whether to veto it. For more information or to arrange an interview with a Becket attorney, please contact Melinda Skea at media@becketlaw.org or 202-349-7224. Interviews can be arranged in English, Chinese, French, German, Portuguese, Russian, and Spanish. Becket is a non-profit, public-interest law firm dedicated to protecting the free expression of all religious traditions and has a 100% win-rate before the United States Supreme Court. For over 20 years, it has successfully defended clients of all faiths, including  Buddhists, Christians, Jews, Hindus, Muslims, Native Americans, Sikhs, and Zoroastrians  (read more here).